Spiderman Costumes for Bryson - It's Gravy, Baby! 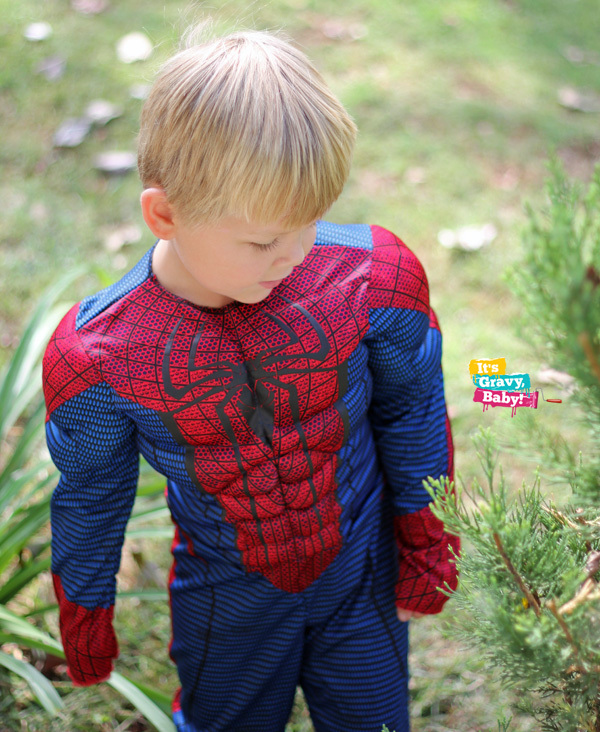 The Spiderman costume featured in this post was provided for our review. All thoughts and opinions are my own. 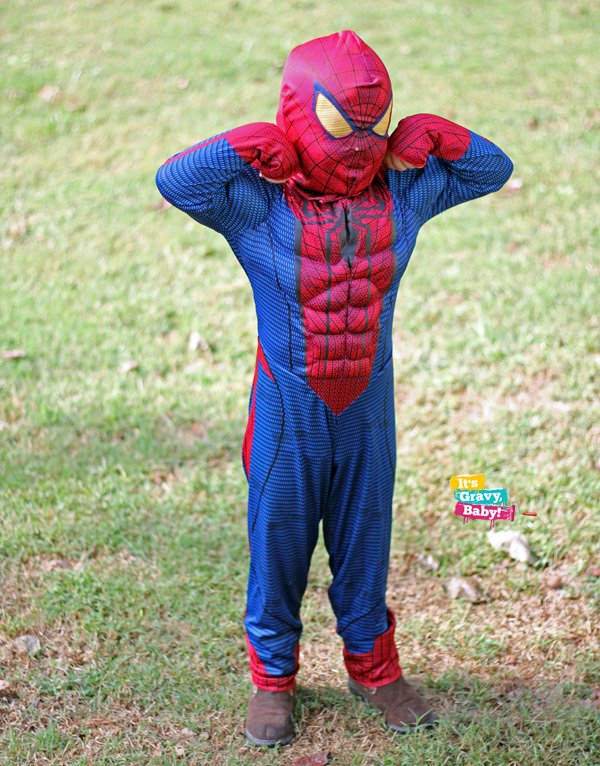 For some unknown reason, Bryson decided on Spiderman for his Halloween costume this year. I have absolutely no idea why and I’m not sure that he’s ever even watched Spideman. But, that’s what he chose and who am I to argue!? I’m just glad he made a decision and stuck to it. Bella, on the other hand, changes her mind hourly. I thought she was set on Sofia the First, but I was wrong. I’ve heard everything from a mouse to a mermaid. When Bryson put on his Spiderman costume, Bella’s eyes lit up and I knew. She had mentioned being a “Super Hero Girl” more than once and I can only imagine the cuteness as we walk through the park Halloween night with our Spiderman and our Spidergirl. 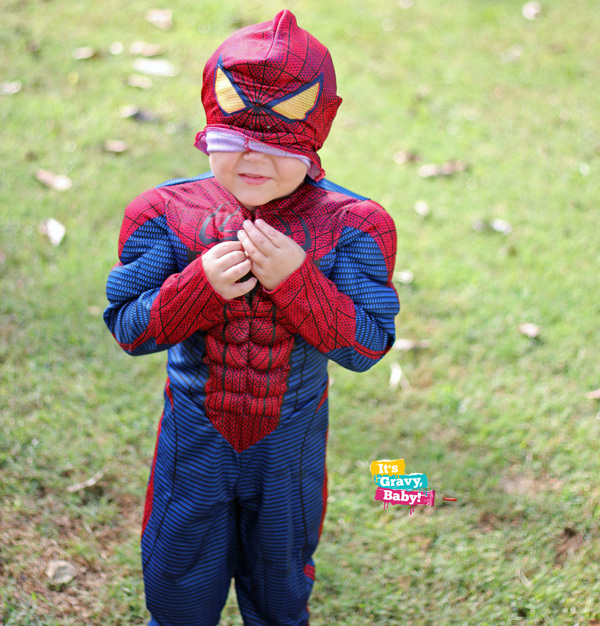 The folks at Halloween Adventure, a new sister site to Costume Discounters, were kind enough to send us a Spiderman costume for Bryson. Having worked with several of their costume stores over the last 2+ years, you could say that I’m a fan. We’ve been pleased with all of our costumes and Spiderman is no different. It’s a simple two piece set- the full body jumpsuit with a muscle torso and the overhead mask. The fit is very similar to Bryson’s Woody costume and both the jumpsuit and mask feature Velcro closure in the back. The Spiderman costume by Disguise runs true to size. Bryson is wearing a size small and the sleeves are just a tad too long, not enough to bother him or me. He regularly wears a 5 or 5T so that’s to be expected. Bryson helped me shop online at HalloweenAdventure.com to pick out his Spiderman costume. I attempted to talk him into a different style without the full face mask, but he insisted that this is the one for him. I think it’s the muscles? Must be a man thing! He wanted to make sure he picked a costume that was darker and this one with it’s navy and dark red works perfectly. He was super excited when I showed it to him, but it was bedtime, so he had to wait until morning to try it on. These photos are the result of waiting until morning. He had been up less than an hour when he remember and asked me to help him get dressed in his new Spiderman costume so he could go outside to play. 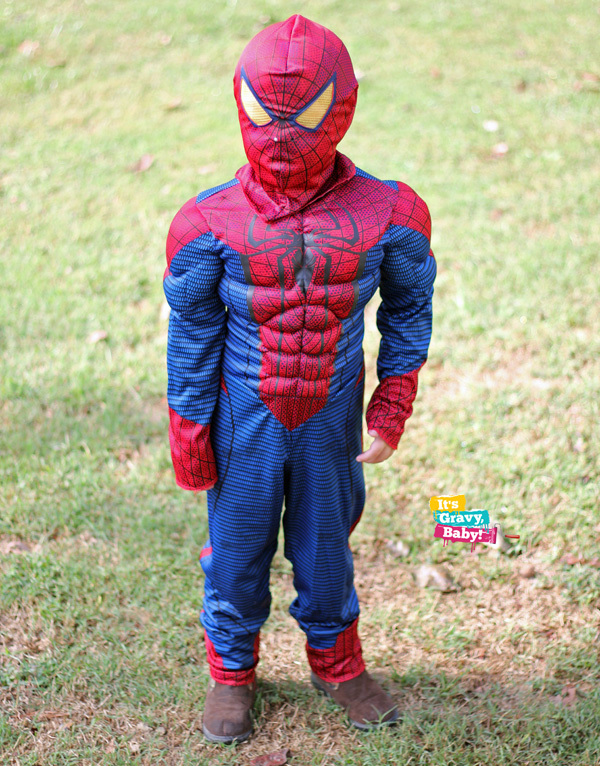 His costume is called the “Children’s Muscle Spiderman Movie Classic Costume” and retails for $32.99. You can find it at HalloweenAdventure.com. Connect with Halloween Adventure on Facebook and Twitter to find the latest deals and coupons as well as the newest costumes. One last shot of Bryson flexing and showing me those muscles! He was so proud of his new Spiderman costume that he didn’t mind me taking photos of him in it. Have you shopped for Halloween costumes yet? I also love the picture with the mask half-way on… I don’t know why, but that one just makes me laugh… I can just imagine Spiderman running into the door because he can’t see. Okay, he is the CUTEST Spiderman I’ve ever seen! Oh he makes a CUTE spiderman! Here in the UK, we don’t do general fancy dress at Halloween, our costumes are all spooky themed. This year, my son is a werewolf and my daughter a witch. I can’t wait for the 31st! He looks too cute in his Spiderman costume!! David wore that same costume last year. He still talks about it! (It won’t fit him for this year.) He and his big brother want to be pirates and Cadence changes her mind all the time, too. My 2 you daughter is going as spider girl princess (she has the costume I just made her a tiara out of pipe cleaners thread and beads to look like webbing) and my 4 you son is going as Spiderman. We are meeting friends for a Halloween parade… bat man Robin and another Spiderman. We have this same costume…. I love the muscles!